There has been much in the news lately, about radical terror organizations. Stories about Isis and other extremist groups are in the news daily. Many of the headlines involve bombings, shootings or beheading. Violence is the preferred method of gaining converts, and advancing there political, and religious agendas. Should a Christian ever be extreme, or radical, in there thinking and actions? I say yes we should! Should we take up arms and join the fight against other extremest groups, that oppose are religion, and way of life? Jesus was a radical, and they wanted him killed for his outrageous thinking. What would the beliefs and actions be of such an extremist? Is it time to take up arms and fight, to preserve our way of life? Mathew 5: 43-44 Ye have heard that it hath been said, Thou shalt love thy neighbour, and hate thine enemy.44 But I say unto you, Love your enemies, bless them that curse you, do good to them that hate you, and pray for them which despitefully use you, and persecute you; This is truly radical thinking! Love, bless and pray for our enemies! Romans 12: 20-21 Therefore if thine enemy hunger, feed him; if he thirst, give him drink: for in so doing thou shalt heap coals of fire on his head.21 Be not overcome of evil, but overcome evil with good. The world is being overcome with evil, we are instructed to overcome evil with good. Is this practical advise? Wouldn’t our enemies just take advantage, and destroy us? 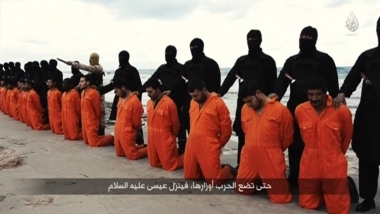 Christians in many parts of the world are being persecuted and killed, for their love and faith in Jesus. Mathew 5:11-12 Blessed are ye, when men shall revile you, and persecute you, and shall say all manner of evil against you falsely, for my sake.12 Rejoice, and be exceeding glad: for great is your reward in heaven: for so persecuted they the prophets which were before you. 1 Peter 4:12-14 Beloved, think it not strange concerning the fiery trial which is to try you, as though some strange thing happened unto you:13 But rejoice, inasmuch as ye are partakers of Christ’s sufferings; that, when his glory shall be revealed, ye may be glad also with exceeding joy.14 If ye be reproached for the name of Christ, happy are ye; for the spirit of glory and of God resteth upon you: on their part he is evil spoken of, but on your part he is glorified. Jesus told us we are blessed for being persecuted for him. And Peter said we should rejoice, when we experience any fiery trial for our faith, and love of Jesus. What are some other traits of a radical Christian? Luke 6:34-35 And if ye lend to them of whom ye hope to receive, what thank have ye? for sinners also lend to sinners, to receive as much again.35 But love ye your enemies, and do good, and lend, hoping for nothing again; and your reward shall be great, and ye shall be the children of the Highest: for he is kind unto the unthankful and to the evil. Here we are instructed to lend to those in need, not taking into account their ability to repay us. Ephesians 4:28 28 Let him that stole steal no more: but rather let him labour, working with his hands the thing which is good, that he may have to give to him that needeth. And again we are instructed to put the needs of others above our own. How about fame and fortune, positions of strength and authority? How do they fit into the life of the radical Christian? Mathew 23:11-12 But he that is greatest among you shall be your servant.12 And whosoever shall exalt himself shall be abased; and he that shall humble himself shall be exalted. Here the Lord instructs us to be a humble servant. If we love this world, or the country we live in, shouldn’t we want to fight to preserve it? 1 John 2:15 Love not the world, neither the things that are in the world. If any man love the world, the love of the Father is not in him. They that are of this world, will fight, even to the death, for the things of this world. Mathew 15:19 If ye were of the world, the world would love his own: but because ye are not of the world, but I have chosen you out of the world, therefore the world hateth you. Jesus tells us we are not of this world. Colossians 3:1-2 If ye then be risen with Christ, seek those things which are above, where Christ sitteth on the right hand of God.2 Set your affection on things above, not on things on the earth. In conclusion, a radical extremist Christian would love his enemy, and do good to them. He or she would rejoice when they are persecuted for the name of Jesus. They would be a humble servant to others, not exalting themselves, or their position in life. They would give to the poor and needy, and lend, not giving regard for the ability of the borrower to repay. They would not love this world, or the things that are in it. These traits, and many other things would define and exemplify the life of a radical Christian extremist. The life of the greatest Christian extremist is written in the pages of the four gospels of Christ. Lets all strive to be more like our wonderful Lord Jesus, and less and less like the extremists of this world. ← Why we must learn to wait upon the Lord. All of creation is groaning for the manifestation of these radical sons of God; and it is happening. More believers are coming into the knowledge of who we are in Christ and are purposing to live according to His will. There’s no other way to be great in the kingdom except through humility and service fueled by love and compassion. Thank you for that great, and well thought out comment. I have tried to go back to the time when I was young, and took the word of God much more literally. Now, we can truly appreciate the wisdom of God. The kingdom belongs to those with “child-like-faith”.